Make sure you don’t bring home more than you expect. No matter if you are buying plants in the garden center or from a mail order company, check your plants before you buy or plant them. They could have bugs or disease that you don’t want to bring home. While most plant companies do their best to supply good healthy disease free plants that is not always what happens. An excellent example is impatiens downy mildew that decimated the Impatiens growing in the northeast several years ago. Working the master gardener hotline we were inundated with unhappy gardeners who found their Impatiens dying on them. One day the plants were fine the next they were just stalks. 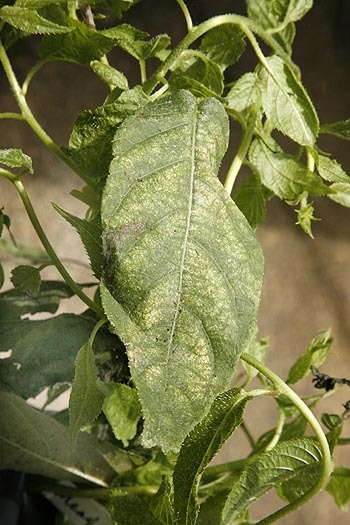 This disease was brought in on plants grown outside the area and looked fine when they were sold but soon developed the disease and all of them died. Since this disease can live on in the soil for many years it now means that we can no longer grow Impatiens in our area a devastating loss for those who loved color in shaded areas. Just last year I had a man call our Master Gardener Hotline and ask how to deal with a pest on his plants. After some questioning the story unfolded thus. He had found some plants at a big box store on heavy discount. They had bugs on them, he could see that but he thought he could ‘save them’. So he bought them and brought them home. He planted them in his garden then sprayed them with something. Now he is calling me because his spray did not work and the bugs have spread to all the plants around is ‘saved’ plants some of which are now dead and others are on their last legs. Moral of the story. Don’t bring home diseased plants and try and ‘save’ them. Pass them right by and go for the healthy ones only. It might sound like a bargain but if it takes off in your garden it could cost you dearly in other plants. How to inspect plants before you buy. Always look carefully at every plant you buy in a garden center. For the most part good garden centers are very careful with their plants and only sell ones in excellent health but small numbers of bugs or lurking diseases can get through as cased by the impatiens disaster. Look at the leaves are the mottled, do they have streaks. Are the leaves shiny and sticky? This is a sure sign of leaf sucking bugs. Check the plant but also look up. 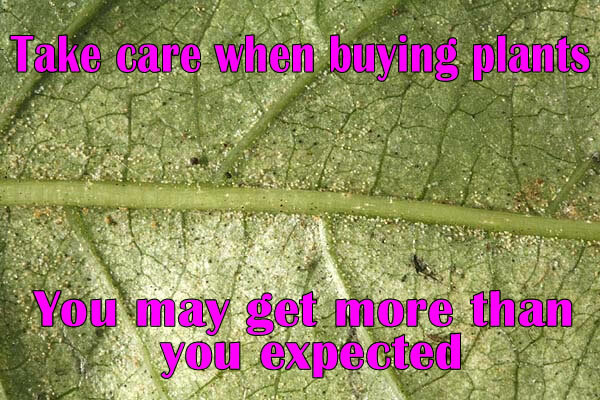 Sometimes the plants have been put under trees or other plants which may have the bugs on them not the plant you want to buy. Check all the leaves just to be sure. Check the buds. Often bugs like to hang out on the newly formed bugs since they are young and tender. Look to see if there are any extra lumps or spots. Look at the stems or tree bark . Are there any bumps. Can those bumps be wiped off with your fingers? If so its got scale you don’t want it. Scale is very hard to get rid of. Look for any downy, powdery or white splotches on the leaves. 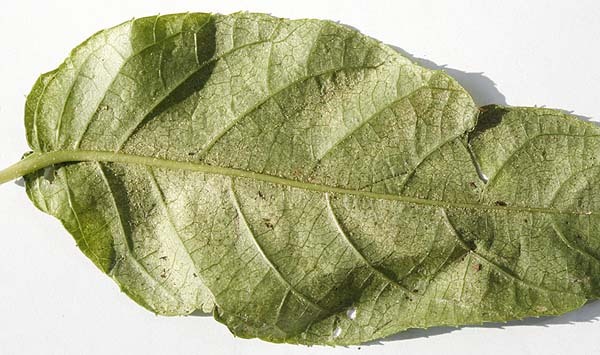 Mildew is common on quite a few plants you may get it in your garden anyway but don’t take home extra. Look at the overall plant. Does it have black or dying leaves, leaf tips or shoots. This could be a problem too. Go with your gut. If the plant just does not look healthy, leave it behind. Find another garden center that has better plants. You may have to pay more but its worth it not to kill the rest of your garden. Most nurseries that sell by mail do a wonderful job. We have bought plants many times from different companies. Sometimes there is no choice if you want a specific plant then you have to. However you should always check all material that comes in. Don’t just assume that its fine. Recently we purchased some new kiwi vines (long story for another blog entry). One of our interns started to unpack them until I yelled at them to stop. The leaves of the plants were all mottled, an obvious sign that something was wrong with the plants. 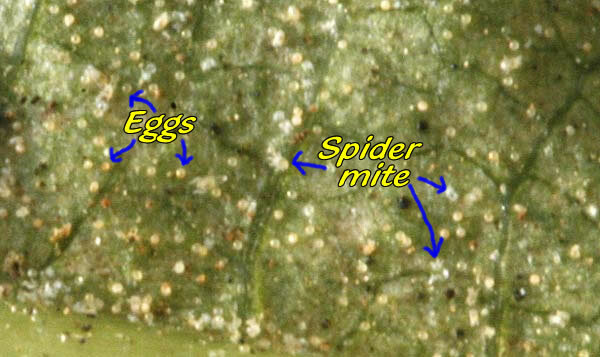 I looked under one of the larger leaves and was shocked to see hundreds of spider mite eggs. This plant was totally infested! I have never had such a plant sent to me before. I contacted the company and they issued a refund since their whole greenhouse was infested they could not send me clean healthy plants. How come they did not notice when they packed the plants? How come no one was scouting the greenhouse and noticed that there was a huge infestation of spider mites? This was one of the worst I have seen. This should have been spotted in the greenhouse long before it go this bad. How could you try and send me such an infested plant? How many other people had they sent infested plants to? Hopefully other gardeners who received such plants also complained and got refunds. Never accept any material that has disease or bugs on it. You introduce that into your garden and it could infest all your other crops. Always inspect any plant that arrives are your door before you plant it. Make sure there is nothing wrong with it. If unsure then isolate the plant somewhere away from all other plants the may in any way be similar and grow it on it a pot for a while to see what develops. This is what all commercial nurseries do. They are always buying material in from other nurseries. They have a ‘quarantine’ area where all new plants go for a while to be checked out and ensure that they don’t have any problems before they are moved into the ‘general population’ of the main nursery. Commercial growers don’t ever want to introduce something into their plants that is going to cause a problem because it could cost them a great deal of money. You don’t want that either. It may not be your livelihood riding on the plant disease but the beauty of your garden is. So check your plants out. Make sure they are strong and healthy before you get them anywhere near your other garden plants. Never ever bring home a sick plant and try to ‘save’ it. It could cost you your whole garden.